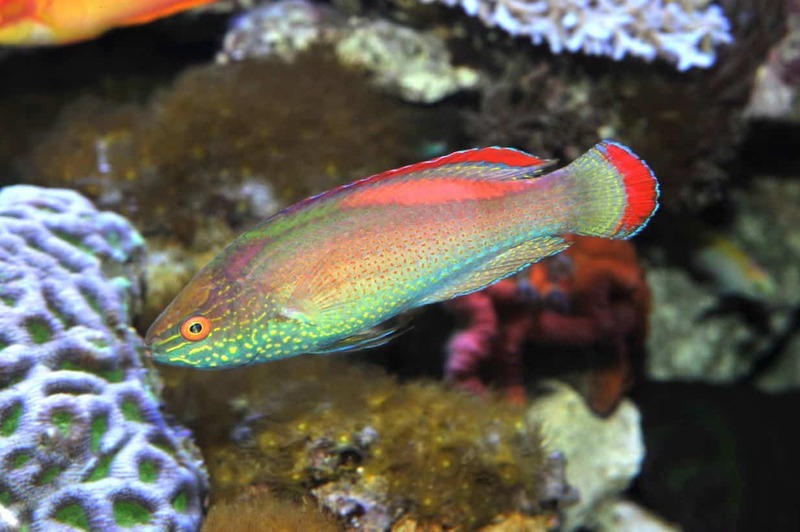 This is the complete guide to keeping Pink Margin Fairy Wrasse (Cirrhilabrus rubrimarginatus) which is one of my all-time favorite Saltwater Wrasses. Originating from southern Japan through to Indonesia these brightly colored wrasses make a beautiful addition to any saltwater reef tank. But are they easy to keep and are they compatible in every type of saltwater fish tank? 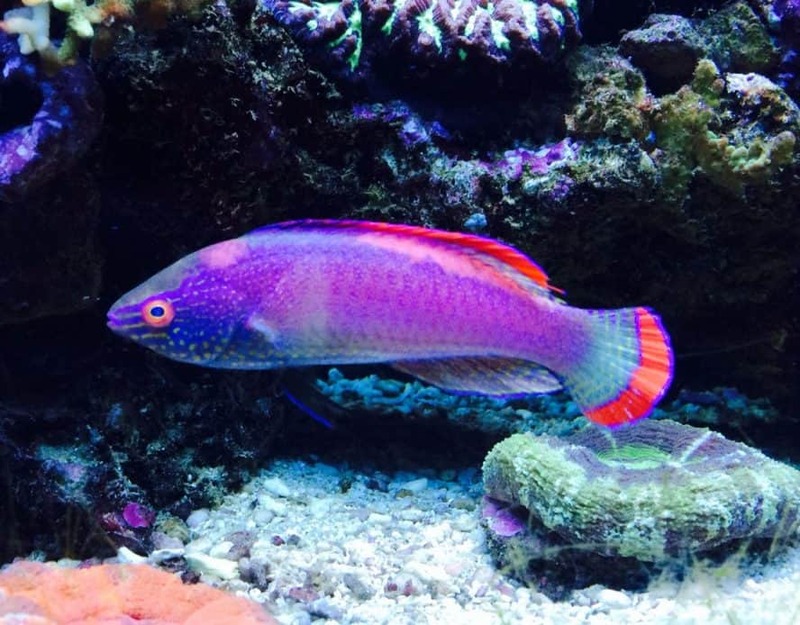 In this, in-depth review we will give you all the help, advice and information you’ll need to establish if the Pink Margin Fairy Wrasse is suitable for your home aquarium. Found in water from the Western Pacific: north to the Ryukyu Islands, through the Philippines, Palau, and Indonesia to Vanuatu, Fiji, and Tonga at depths of 25m – 50m the fish are found in abundance. Often in groups of several males with 20+ females. Juveniles can be found at around 2-20m swimming on their own in shallow reefs in and around rocky slopes and caves. Adults will venture deeper at around 20-50m and found in more open waters but always close to the reef and rocks. From the family Labridae these wrasses are one of the most colorful fish kept in the home aquarium with the capability to change their colors depending on their mood. This fish is categorized in the IUCN Red List of Threatened Species as ‘ Least Concern ‘ Meaning there is no immediate worry or concern for the future of this fish. It is found in large numbers in and around the reefs in the Western Pacific and is breeding well. These fish are not endangered. This distinctive wrasse has two areas of red margin on its dorsal and tail fin hence the name. The male is more colorful than the females and their color will intensify during courting time. The body of the male is overall green and pinkish with lots of fine dots on the sides. The abdomen is whitish and the head a greenish yellow. Males are larger than the females, the females still have that distinctive red margin but normally just displayed on their dorsal fin. The color and patterns cannot be guaranteed when you buy one as these fish as they can change in appearance. Often I have seen some amazing specimens in peoples tanks at home and then seen inferior fish for sale in pet stores and aquarium shops. The happier your fish the brighter their color will be, also having a matched pair will also reveal their colors better. Provide the right environment and water conditions and you will see them blossom in front of your eyes. When they are in full color there is no better wrasse to keep in your home aquarium. All of the Cirrhilabrus 43 species are very attractive and stand out in any aquarium. When seen in large groups in the wild it is an amazing sight to be seen. Divers have reported that these fish are normally seen on their own or in pairs but the odd larger group has been spotted consisting of 10+ males and 20+ females. Pink Margin Fairy Wrasse can grow to 5-6″ and therefore will require a saltwater tank of around 80-90 Gallons to give them the room to thrive. They are fast moving inquisitive fish and will explore all areas of the tank. They like plenty of caves and rocks to dart in and out of and play amongst. They will not bother any corals or invertebrates making them perfect for the reef aquarium. Ensure you make regular water changes to ensure top quality water will as little disturbance as possible. They are very hardy fish and can withstand small changes in water temperatures. They prefer water conditions of 72-78° F, dKH 8-12, pH 8.1-8.4, sg 1.020-1.025. Soft and fine sand substrate is preferred but unlike other Wrasses, they don’t bury themselves at night in the sand so the sand can be slightly bigger grains if you prefer. A medium water flow through the tank is advised to replicate their natural environment and allow the fish to feed. We use Uniclife controllable wavemaker jets to ensure a constant natural water flow throughout the tank. This also helps oxygenate the water and control water temperature better. They are available from Amazon and the link has been provided above. All lighting conditions are fine for this fish, bright or dim this fish won’t mind either lighting conditions. These fish are carnivores and love meaty foods. Offer them a selection of dried and live foods to ensure they have a varied diet. Dried shrimps and flake foods will also be accepted once the wrasse is settled into their new home. They will even eat tablet and sinking pellets from the tank floor. Feed at least twice a day. If you have larger fish in the tank you will need to make sure your Pink Margin Wrasse doesn’t miss out at feeding time. They are fast and active fish but sometimes get overlooked at feeding times. Dropping food in different areas of the tank at the same time is a good way to ensure they receive their share of the food. Even though these fish are Carnivores I found that mine loved to eat seaweed sheets that I held in place with a plastic magnetic clip. As fish keepers, we have a duty to ensure we provide the best possible conditions for our fish. Any fish or animal kept in captivity should have the best possible foods, living space, and care. Therefore supplying a variety of foods is vital for their care. These fish are suitable for all types of aquariums. They are fine will most corals and invertebrates and will not eat them. They will and have been known to attack shrimps and can pester them if they don’t have enough rocks to escape to. These fish can live happily with other wrasse but we advise you to introduce them at separate times ensuring you add the smallest first and slowly build up in size. If you add a large Wrasse first then they can become territorial and will attack any new members added especially if they are smaller. Smaller fish are perfectly fine to live with Pink Margin Fairy Wrasse like Green Mandarin Dragonet fish, Firefish gobies, The Magnificent Foxface, Damselfish and many other small fish. Larger fish are fine if your tank is of a suitable size around 80- 90 Gallons plus. 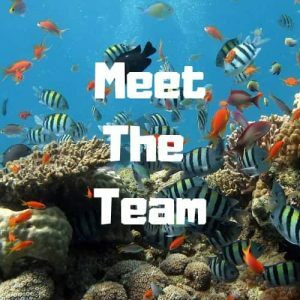 Angelfish, Tangs, triggerfish and other larger fish are fine. These fish are fantastic jumpers and have been known to jump out of their tank and be found dead the next morning. So ensure you fit a tight lid or hood to your tank especially in the first few days of introducing them to their new home. Once they have acclimatized to their new home the risk of them jumping out is reduced, but still a possibility. Unlike other wrasses, these fish don’t bury themselves under the substrate too often. They form a Mucus Cocoon similar to what Parrotfish do and trap themselves between rocks to sleep and also when they feel threatened. This Mucus is not harmful to other fish and won’t affect your water conditions. Wrasse is prone to suffer from “ich” (white spot disease) or other infectious diseases so keep a close eye on their health. They react quickly to medication and 9 times out of 10 recovers quickly. We have not heard of this fish being bred in captivity or in the home aquarium. It has been bred in zoos and public aquariums but not by the hobbyist. Would we recommend adding one of these fish to your aquarium? absolutely! I can’t think of a more colorful, peaceful fish than the Pink Margin Fairy Wrasse to add to your tank. Affordable, easy to keep, non-aggressive and beautiful seems like a winner to me.